The tool is a tremendous timesaver for school staff. The public can easily locate pertinent boundaries for an address. Users can create boundary maps for elementary, middle, and high schools. August is "back-to-school" month for many school districts. School administrative offices are busy preparing for students, planning schedules and bus routes, and handling new students and transfers. Typically, schools and administrative offices receive numerous calls daily inquiring if an address falls within a certain elementary, middle, or high school boundary. Parents' decisions about where to live or buy a house often depend on what school district the address falls within. The Springfield School District 186 School Locator, developed using ArcIMS, provides an easy interactive interface for searching for schools. For years, the Springfield, Illinois, Public School District 186 Transportation Department has been using paper maps to maintain the elementary, middle, and high school boundaries. If a boundary changed, all the maps would have to be redrawn by hand and sent out to all the schools. With new streets being built and subdivisions developed, it was a constant and time-consuming process to keep the maps current. In addition, the Transportation Department handled numerous calls daily requesting boundary information. 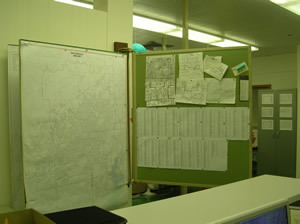 Once a call was received, Transportation Department staff would have to manually look up the address, then reference directories, map books, and several different maps to determine the boundary information. In fall 2006, following a recommendation by the Sangamon County GIS Department, District 186 sought the services of GIS Solutions, Inc., an Esri Business Partner in Springfield, Illinois, for the implementation of GIS technology into the agency's map production procedures. In addition, District 186 wanted to develop an application for the public where users could enter an address and return relevant school boundary information. The school district acquired a license for ArcView and ArcIMS, and GIS Solutions created the school boundary layers for the district's desktop project and the ArcIMS application. 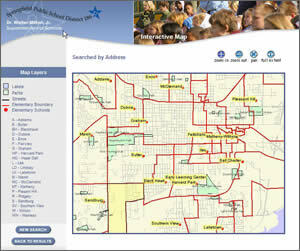 The boundaries were created using NAVTEQ street data and a parcel layer, and the school district launched its custom ArcIMS School Locator application, which allows users to identify the correct school(s) based on the address of the student (gis.springfield.k12.il.us/locator/index.jsp). 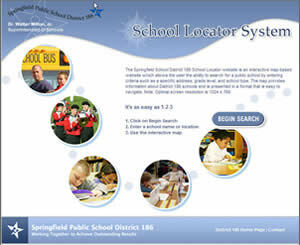 Users can search for an address to determine school boundaries and also view a map of the schools and boundaries. Not only has the Transportation Department benefited from the implementation of GIS, but the administrative offices have realized savings in time and cost since the School Locator was launched. For example, district personnel in Student Services would typically receive 30 to 40 requests a day to look up school boundaries for a particular address. "The application has been a huge timesaver for us," says Julia Ellis, administrative assistant for District 186 Student Services. "I would spend as much as eight hours a day looking up locations on all our paper maps to find the school boundaries for an address. I would have to look on the elementary map, then the middle school and high school maps. And in some cases, it would be necessary to view small detail maps if the address bordered another school district." The School Locator functions as a point-in-polygon query. The application uses a geocoding service, which offsets the geocoded point from the street centerline. The correct polygon information is then obtained from the geocoded point. Once an address has been submitted, ArcIMS returns the correct boundary school and grade information. The application also provides other search criteria, such as the ability to search for schools by name or by school type (gifted, magnet, etc.). In addition, users can create their own maps of the various boundaries. The success of the locator application has been widespread in the school district and with the public. Many calls that the schools and administrative offices received were from local realtors regarding school boundary information. With this information available online, they now have all the information they need and no longer have to call a school or district office to have someone research the information for them. District 186 staff would have to refer to the paper maps, grids, and small insert maps to locate an address and determine school boundaries. "In the past, our staff would receive calls from parents asking if they live within our boundary," says Kris Huddleston, principal of Franklin Middle School. "Staff would literally try to find the address on the maps or in the phone book. Now, staff can quickly tell parents what school boundary their address falls within and refer them to the Web site for any additional searches they may have. What once took a significant amount of staff time in answering inquiries now is done in a matter of seconds." For more information, contact Rick Koopman, transportation director, Springfield School District 186 (tel. : 217-525-3096), or Lex Bitner, GIS Solutions (e-mail: lbitner@gis-solutions.com, tel. : 217-726-1503).